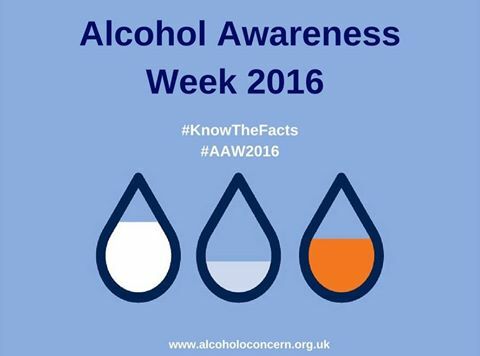 The 14th – 20th November marks Alcohol Awareness Week 2016. The aim of Alcohol Awareness Week is to get people thinking about alcohol – how it affects us as individuals, families, communities and society as a whole. This year’s theme is alcohol and health; looking at knowing the risks associated with alcohol by focusing on the relationship between particular health conditions and alcohol. This includes cancer, depression, dementia, breast cancer, diabetes, hypertension and brain damage. It is important to distinguish between the different ways that alcohol is consumed. Research suggests that having the occasional drink is fine, but that “binge” drinking can have serious health risks. You can read more about alcoholism in our Help with alcoholism fact sheet. We also have a list of useful support organisations that can be found in our Directory, as well as the story of a journey to recovery. Our Health Support Programme can assist those struggling with alcoholism, as well as substance abuse, gambling and eating disorders (more fact sheets are available here). For information call 0808 168 2233, email info@pharmacistsupport.org or LiveChat us. You can also contact our Health Support Programme helpline direct on 0808 168 5132.